Oh, how I love this age we're living in in which women characters on the big and small screens are allowed to be inappropriate, messy, b**chy, and sexual. It just further illuminates the myriad complexities women embody, painting a more thorough profile of inclusive feminism. 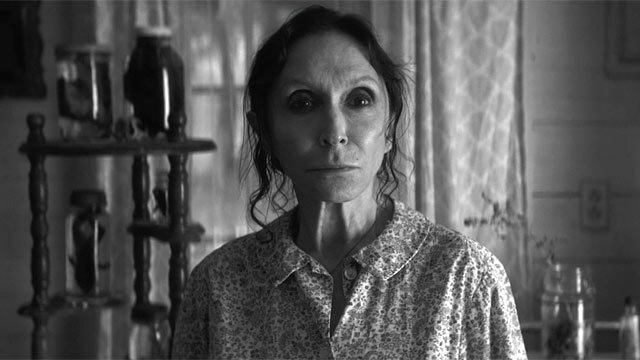 But even while Hollywood has been consistently pushing these boundaries in more recent years, few films have explored morbid sensuality through the gaze of a woman better than writer/director Nicolas Pesce's THE EYES OF MY MOTHER. Part provocative horror and part WTF-is-this, THE EYES OF MY MOTHER tells the story of Francisca, a young woman (Kika Magalhaes) living on a humble Portuguese farm who has been fascinated with death from a very early age. Her unusual enchantment, influenced by her surgeon mother (Diana Agostini) who introduces her as a little girl to the art of removing eyeballs from dead animals, has desensitized her to death, leading her to a life of intense solitude. It isn't until she reaches adulthood, marked by a horrible tragedy, that she begins to yearn for human connection--at any cost. At the hands of a less inspired filmmaker, THE EYES OF MY MOTHER would have surely been reduced to yet another silly iteration of the Addams Family-meets-The Beverly Hillbillies fish-out-of-water trope. (It's important to note here that I love both these series immensely, but THE EYES OF MY MOTHER they are not). Instead, Pesce delivers a haunting coming-of-age, semi-goth drama that presents Francisca as a three-dimensional villain who's more The Girl from A Girl Who Walks Home Alone at Night than Wednesday Addams. But very much alive, living in the countryside, and illuminated by Zach Kuperstein's gorgeous black-and-white cinematography. Magalhaes consumes each scene ready to burst from sheer isolation, so much so that even when she's sharing a scene with the few people Francisca has put in her path, you still feel her overwhelming loneliness and sad desperation. Crafty yet naive, confident yet deeply mournful, Magalhaes's singular portrayal is so seductive that you almost forget that you're rooting for a sociopath. Almost. So what happens when a woman comes of age, develops sexual urges and a fierce maternal instinct, after being socially barricaded on a farm all her life? When you've grown up surrounded by death and decay, how do you react when it takes someone you love? Does it matter? And if so, how do you show that? With THE EYES OF MY MOTHER, Pesce explores the nature of human instinct and arrested development in a way that is uncomfortable to watch yet immersive just the same. It becomes increasingly clear that none of the characters, including our protoganist Francisca, realize that they are trapped in a horror narrative until it's too late. That's what makes it all the more bone-chilling. Ohh this sounds interesting! I'm sold.